Recognized worldwide as a musical phenomenon, Grammy-nominated Andrés Cárdenes parlays his myriad talents into one of classical music's most versatile careers. A ferocious, passionate and personally charismatic artist, Cuban-born Cárdenes has garnered international acclaim from critics and audiences alike for his compelling solo violin, conducting, viola, chamber music, concertmaster and recorded performances. The 2006/07 season celebrates the 35th anniversary of his professional debut with concerts on four continents, including several world premieres of works dedicated to him. Since catapulting into the upper tier of acclaimed violin virtuosos after capturing Second Prize in the 1982 Tchaikovsky International Violin Competition in Moscow, Mr. Cárdenes has appeared as soloist with over one hundred orchestras on four continents, including those of Philadelphia, Pittsburgh, Los Angeles, St. Louis, Moscow, Bavarian Radio, Helsinki, Shanghai, Caracas and Barcelona. He has collaborated with many of today's greatest conductors, including Lorin Maazel, Rafael Frübeck de Burgos, Mariss Jansons, Charles Dutoit, Christoph Eschenbach, Sir André Previn, Leonard Slatkin, Sir Andrew Davis, Gerard Schwartz and David Zinman. Mr. Cárdenes is deeply committed to the music of our time. He has commissioned, premiered and/or recorded more than sixty-five works by composers such as Sir André Previn, Leonardo Balada, Edgar Meyer, Ricardo Lorenz, Eduardo Alonso-Crespo, Ramiro Cortés, David Stock, Roberto Sierra, Gunther Schuller and Thomas Oboe Lee. Mr. Cárdenes is in growing demand as a conductor. His appearances with the Bavarian Radio, Neue Philarmonie Westfallen, San Diego Symphony, Sinfonica de Venezuela, Orquesta Fundacíon Beethoven (Santiago, Chile) and the OFUNAM Orchestra of Mexico City have received rave reviews. Headlines proclaimed "Cárdenes conducts Pittsburgh Symphony with epic mastery" (Pittsburgh Tribune-Review) after recently stepping in for an ailing Robert Spano. Mr. Cárdenes has served as Artistic Director and Leader of the Pittsburgh Symphony Chamber Orchestra since its inception in 1999. A dedicated chamber musician, Mr. Cárdenes has toured with the Lincoln Center Chamber Society and has appeared in concert with his friends and colleagues Christoph Eschenbach, Edgar Meyer, Pinchas Zuckerman, Menahem Pressler, Lynn Harrell, Mark O'Conner and Jaime Laredo. Cárdenes has been a member of the Diaz Trio since 1996, and the Carnegie Mellon Trio since 1989 and makes regular concert appearances at the Mainly Mozart, Steamboat, Rockport, Brevard, Domain Forget, Skaneateles and Orcas Island Music Festivals. This year and next Mr. Cárdenes is embarking on a project to record many standard and contemporary concerti. Due for release in 2006 are recordings of concerti by Brahms, Mendelssohn, Barber, David Stock and Chausson's Poeme on the Artek and Albany labels. Plans to record Bartok's Second Violin Concerto and the new version of the Viola Concerto are slated for the fall, along with sonata recordings with pianist Ian Hobson. A recording of the complete works for violin by Leonardo Balada is already underway with a 2007 release. Cárdenes' discography includes over a dozen recordings of concerti, sonatas, short works and chamber music on the Ocean, Naxos, Sony, Arabesque, RCA, ProArte, Telarc, Artek, Melodya and Enharmonic labels. The year 2006 marks the 30th anniversary of Mr. Cárdenes' renowned teaching and pedagogical career, which began as an assistant to his teacher and mentor Josef Gingold at Indiana University. 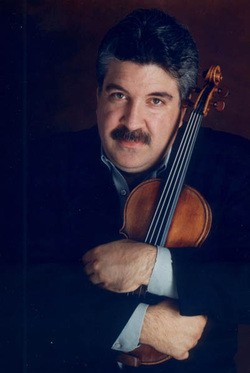 Today, Mr. Cárdenes continues Professor Gingold's legacy and discipline while holding the title of Distinguished Professor of Violin Studies and the Dorothy Richard Starling/Alexander Speyer Jr. Endowed Chair at Carnegie Mellon University's School of Music,. In addition, Cárdenes gives Master Classes regularly at the Royal Conservatory of Music in Toronto, the Manhattan School, and at virtually every major university and conservatory in the United States. Mr. Cárdenes was appointed Concertmaster of the Pittsburgh Symphony Orchestra by Maestro Lorin Maazel in 1989 and holds the Rachel Mellon Walton Endowed Concertmaster Chair. He is married to violinist and music educator Monique Mead. They have a three year old daughter, Isabel-Annik, and a two year old son, Marco Valentin.